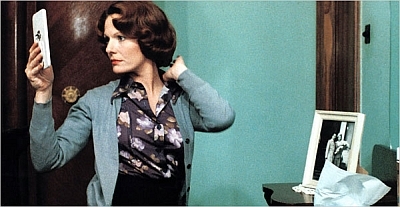 Delphine Seyrig as Jeanne Dielman. Courtesy Paradise Films. A new 35mm print of Chantal Akerman’s Jeanne Dielman, 23 Quai du Commerce, 1080 Bruxelles (1975)–an avant-garde cult hit about a housewife keeping a very tight schedule–is showing this Friday, October 23, 7:00 p.m. at Emory University, in White Hall 205. The running time is 200 minutes. Admission is free. For more details see Andy Ditzler’s Film Love. I have to confess that I’ve never seen Jeanne Dielman, though it is finally available on DVD from the Criterion Collection. I’ve been waiting instead to see a good 35mm print, since what I’ve read so far indicates that this is one film which demands the finely rendered visual texture and sense of space that only a theatrical presentation can provide. If you haven’t seen any of Chantal Akerman’s films, her Seventies work is fascinating as an extreme example of the long-take aesthetic. Individual shots often run for several minutes without a cut, unfolding in real time while very little seems to happen story-wise. It’s a calculated challenge to the viewer, but the cumulative effect can be surprisingly moving, especially in News From Home (1977) and Les Rendez-vous d’Anna (1978). Criterion is putting out an Eclipse set of Akerman’s other Seventies films in January 2010.